This post is not part of our daily updates…just some final thoughts as we near our destination. It’s 0900 Zulu and I’m on watch. The skies are clear and the stars are bright overhead. 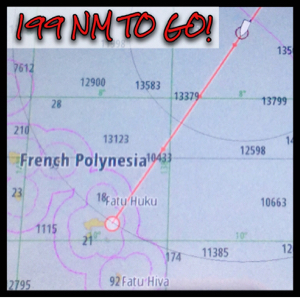 We’ve just under 200 NM to go to reach Hiva Oa and Dazzler is racing along at 7+ knots. She’s on a run like a horse who has rounded the corner and is headed for the barn. I think she knows it’s almost time for her to rest in the crystal clear waters of Atuona Bay and she’s ready. After all, by the time we drop anchor she will have carried us some 3000 NM and she deserves a good rest. I understand how she feels as I think I’ve decided three weeks is about the most I want to be out to sea. And it’s not so much about being at sea as it is the disruption to our daily routine. I love our mornings around the table having coffee and planning our daily adventures. I enjoy our evenings sitting in the cockpit relaxing while Dan plays a few songs on the ukulele or sitting down below watching a movie before bed. Yes, while I’ve thoroughly enjoyed this journey I’m getting excited to get back to normal life aboard Dazzler. I’m ready… *To fall asleep in my honey’s arms and finally be on the same schedule. *To sleep a full eight hours all at one time and only take naps if I really feel like it. *To actually wake up on the same side of the bunk I fell asleep on and not be packed so deeply into the cushion on the opposite side that there’s a permanent indentation of my shoulder and face. *To “stand” in the galley to make a meal rather than perform some form of torturous yoga that requires me to spread my feet as far apart as possible for balance while leaning with the boat and holding onto whatever is not moving with a death grip. *To eat a meal where I don’t have to chase my plate around the table like a greyhound chasing the bunny down the track. *To set something, anything, down and know that it will still be there three seconds later. *For every little task to not be so exhausting because you have to use your entire body to balance and hold on while doing anything. *For the water in the sink to flow in a straight, downward stream from the faucet instead of the angled one we experience underway that always goes in the exact direction you don’t want it to go. *To have clean, non salt permeated clothes I don’t have to smell to see if I can get away with wearing one more day. *To not continually have to look at drying clothes hanging all about the cabin. *To put on a little makeup and do my hair so I can feel like a woman instead of a salty sailor. *To take a long walk on a sandy beach and to swim in crystal clear waters. *To have fruity cocktails with friends who have also made this journey and swap stories of our adventures. *To see these magnificent islands up close and in person while getting to know the people and their customs. Yes, I’ve learned more about sailing in the past three weeks than I have in my entire life. And, I’ve done mental and physical things that I never would have dreamed I could do. As I’ve said before, this adventure is not for everyone but for me, it’s one I wouldn’t trade for all the gold and diamonds in the world. If this list makes you think I’m unhappy or haven’t enjoyed the journey, your are wrong. I have had the time of my life out here. But you know, it’s like a great vacation, you love every second of being away yet at some point you want to get back home. Well, home for us is on Dazzler wherever she may be but mostly home is getting back to our normal routine. P.S. Grape Ape is ready too. For the past 24 hours he’s been sitting atop of the mast with his pirate patch over his eye and a pair of binoculars around his neck. He’s there because Wilson told him real pirates sit at the top of the mast ready to call out, “Land Ho!” at the first sight of land. Falcor is taunting him as he flies overhead yelling, “I see it! It’s over there. No, it’s there. Wait, it’s over there” as he points in different directions. Yes, I think we are all ready to reach our destination. “Look out, Hiva Oa…here comes the crew of Dazzler!” Something tells me these islands will never be the same again! Looks like an amazing place to plant your feet for a while. I am sure the first sight of land will send a rush of emotions through your mind and body. I can’t wait to hear about that experience.